I’ve seen several times in the media recently a suggestion that the merging of library authorities in London would help save them from the cuts. Here below are my thoughts on the matter, listed as ever as pros and cons. Let me know if you think of anything else that should be included or what you think. Normal news reports are below. Economies of scale. These would be considerable as an unified service would replace 29 separate management structures (there are currently 32 authorities: however 5 have already merged with eachother to some extent) with just one. Purchasing, distribution and transport of books would all be unified. There could conceivably be one single library website, headquarters, chief librarian, etc. An example of what can be achieved is Bexley and Bromley who hope to save £350,000 by merging staffing. Advocates could argue that multiplying that for all of London means a possible saving of over £5m. On top of this, Boris has suggests a united authority would become a Trust, allowing millions to be saved in tax. The poor record of some London library authorities, e.g. 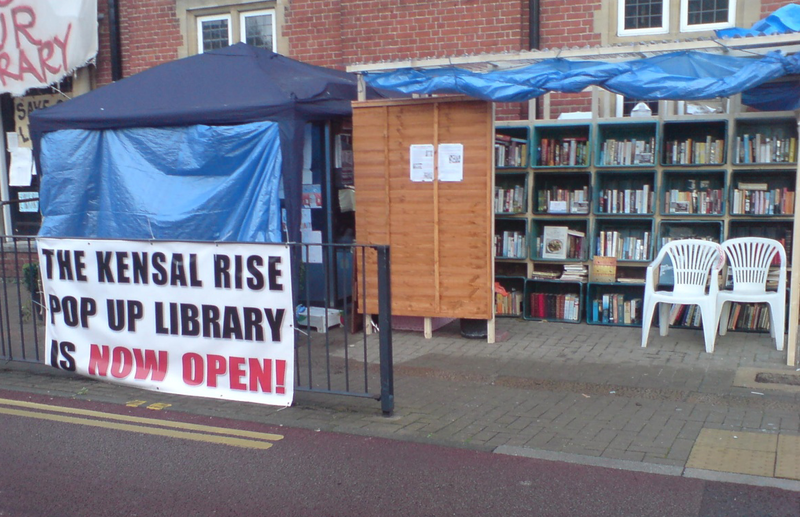 Brent or Barnet, shows keeping things local is not always the best option for libraries. A capital wide library service would instantly become a strong voice for libraries in London unlike the current picture. Capital wide marketing and promotion of services. A pro library mayor would be able to spread best practice examples (such as the often quoted Hillingdon) through all boroughs. This would rationalise provision of branches. Of course, this means, some branches could close but it would make it more likely that there would be a fair spread of libraries rather than the current postcode lottery. One membership card needed for all branches. Being able to order to and from all branches. Mayors don’t have the best of records with libraries. See the example of Doncaster. Such a mayor, or an indifferent one, could do great damage to libraries over the length of their term. Loss of local specialist staff. Economies of scale could lead to the loss of many staff with local knowledge. While we’re at this game, it is worth bearing in mind that economies of scale often means job losses. Bromley and Bexley aim to lose 70 jobs in their merger. Multiply that by fifteen for all of London means over a thousand jobs could go. That’s a lot of unemployment. Localism. This highly influential (amongst all major parties) doctrine means a hands-off approach to local authorities in the belief that those in local areas know best how to serve their communities. Making things thirty times more remote by central diktat goes directly against this. Trusts come with their own problems. Some libraries could close in any rationalisation of services. This would go against the whole reason for unifying libraries in the first place. Loss of local identity. This may or may not happen depending on the policies of the Greater London Library Authority. The London Libraries Consortium already exists, with 15 out of 32 London boroughs sharing procurement (e.g. book purchasing) costs and best practice. Rebranding all libraries costs money. New logos and signs cost thousands. Library authority computer systems often cannot talk to eachother meaning the unification could be theoretical rather than practical. Different types of self-service machine is the most recent example of this. It’s going to really annoy Kensington & Chelsea, Hammersmith & Fulham and Westminster who have recently combined their library services into a “Tri-borough” system. Presumably they’d have to start all over again. Similarly, some library authorities are, or will be soon, opted out of direct council control, with presumably expensive contracts to sign out of – e.g. Hounslow. Soon, Greenwich, Croydon and Wandsworth will also be opted out. Unifying all councils in London would require a change to the law and thus would take a reasonable amount of time to enact. In addition to the London Libraries Consortium, there is the Civica-run SELMS library management system. London Library Change programme has increased co-operation and efficiency. Lack of clear public support or demand for the change. Awards for libraries that improve economic wellbeing – NAPLE (EU). “EIFL (Electronic Information for Libraries) has launched its first Public Library Innovation Programme (EIFL-PLIP) Innovation Award call – for libraries offering services that use information and communication technology (ICT) to improve economic wellbeing of the community.”. $1500 prize plus publicity. Guest post #6: Social media is becoming vital to real-world relationships – Envisioning the Library of the future Arts Council England (Mandeep Hothi). Public libraries need to embrace facebook, twitter and the rest of the web. See also Social Media Revolution – CILIP executive briefing event. Outsourcing: public and private sectors still have much to learn – Guardian. Only a minority of outsourced services are measured to see if they have been of net benefit. “just as much as any perceived skills gap, ineffectual management of outsourcing could also be due to over-prescriptive contracts that are no longer fit for purpose.” Comments below article suggest that giving money to shareholders is not the most efficient use of taxpayer money. Why librarians don’t matter – The Busy Librarian (USA). Infographic claims Wikipedia wipes the floor with libraries. “According to this infographic, you don’t matter. You are replaceable. You are overpriced.You are irrelevant in a world embracing Wikipedia. You are obsolete.”. Comments below argument refute the view of the image. Barnet – Due to several reported worries over the proposed library at the ArtsDepot, I am not counting this as a replacement library as yet. Tally of threatened libraries therefore goes up by one. Northamptonshire – 34 libraries will open from 1pm to 4pm every Sunday and the Central Library in Northampton open from 11am to 4pm. Cuts in hours elsewhere in week to compensate, although overall number of hours increases by eight. 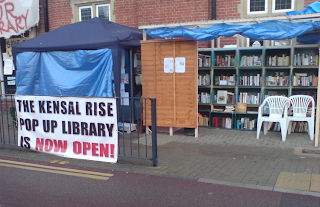 Brent – All Souls College regrets Brent Council’s decision to hand back Kensal Rise and Cricklewood Libraries – Brent & Kilburn Times. ““However, as we are a charity our main focus now has to be on what will benefit All Souls College and we will be undertaking discussions in the future to determine the best route to take for the future.” The spokesman also confirmed that should library campaigners want to occupy the buildings they would have to either pay commercial rents or lease the building, subsequently taking on repair and maintenance rates.”. Campaigner says of council that “They strung us along for months during the court case by saying they would discuss plans after the conclusion and then just threw it out.”. Campaigners urge council to shelve library plans – Harrow Observer. “The Keep Willesden Green group has asked Brent Council to stop the process which will see Willesden Green Library Centre demolished and rebuilt into a library and cultural hub.” … “The group has pleaded with the authority to Stop, Listen and Reflect because it claims it has not properly listened to local people, thousands of whom are against the loss of the treasured building, part of which dates back to 1894.” Only 15 out of 220 people consulted were in favour of the plans. Print article This entry was posted by Ian Anstice on April 12, 2012 at 10:25 pm, and is filed under Uncategorized. Follow any responses to this post through RSS 2.0. You can skip to the end and leave a response. Pinging is currently not allowed. I am 63 and It is my memory that libraries didn’t open on a Sunday. I am being contradicted, and would like to find out the truth of the matter. I believe that since the use of public libraries declined and it was necessary to update their appeal to a more diverse community, making them more accessible at the same time that they began opening on a Sunday. Am I right? and when did that start? Is it a country-wide experience, or just London. I have tried to research this, but have not been successful in finding a satisfying answer.